Seymour (Johathan Haze), a young man that works at a flower shop on Skidrow is about to lose his job because of his clumsiness but manages to convince the shop owner to keep him on because he has been growing a new plant from seeds that a japanese gardener gave him. He brings the plant in to the shop and a customer convinces the owner that it will bring in alot of people just to see it, but the plant is not doing to well and is dying. 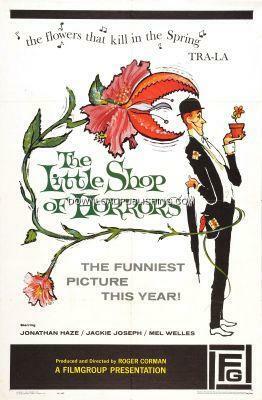 The shop owner tells Seymour that if he can keep the plant alive, he can keep his job. He notices that the plant opens up every evening. When moving another plant out of its light he accidently pricks himself on a thorn and a drop of blood falls into the open plant which soon starts to thrive. Later the plant needs more than just a few drops of blood to stay alive, so Seymour must find a supply of food for the blood thirsty plant.